Injustice League members Multi-Man and Big Sir are in the Dark Side Bar playing poker with a Parademon. They win a piece of technology from Apokolips. They are taking it to their seedy hotel as Clock King and Major Disaster argue of the latter's latest plan while Cluemaster looks irritated with their constant bickering. Disaster thinks it's time for the team to become superheroes to cash in on the merchandising. This diabolical scheme could work in the villains' favor, or it could blow up in their faces should the Justice League get wind of it. Mister Miracle and Green Lantern/Guy Gardner have been looking for a Parademon in hopes of learning of the intentions of Darkseid and Apokolips. They find him being thrown out of the Dark Side Bar. The drunk creature had vomited while kissing a waitress, and Guy and Scott are merely to observe his actions. Unfortunately, Gardner follows his instincts. Green Lantern beats the tar out of the Parademon. In spite of Guy's brashness, he and Mister Miracle learn that the vacationing minion of Darkseid had lost his Parademonic Medibooster in a poker game. The device can heal a Parademon. However, in the wrong hands, it could turn any human using it into one of the beasts of Apokolips. The Parademonic Medibooster has just been activated by the simple minded Big Sir. Should he become a Parademon, the entire world could tremble before his newly found power. As Fire and Ice are shopping, a giant Parademon is rampaging through the city. The creature is, in fact, Big Sir. He transformed in the hotel bathroom as his partners in the Injustice League were waiting for him to come out. Guy and Mister Miracle join Fire and Ice in battling the monster. Hopefully, these members of the Justice League can prevent it from causing more destruction all over the city. If they don't, innocent lives could be lost. As the Injustice League arrives to help Big Sir, Guy Gardner, Fire and Ice are recovering from their fight with the giant Parademon. Guy doesn't trust Multi-Man and the other villains. He begins to fight them. Meanwhile, as the creature moves closer to the JLA Embassy, Power Girl has brought her cat Theodore with her, much to Oberon's fear and loathing. The Big Sir Parademon edges closer as Max Lord forces Oberon and the feline onto the roof. Oberon hurls Power Girl's pet, allowing it to be swallowed by the beast. It spits Theodore out and falls unconscious. Big Sir seems to be rejecting the Apokolips DNA. Mister Miracle can have medics from New Genesis undo the transformation easily. Martian Manhunter suggests that the cat also be tested in spite of Power Girl's protests. The Justice League has saved the day once again, and Booster Gold can tease Blue Beetle endlessly about Theodore. Fire, Ice and Guy Gardner are still discussing the Injustice League's wanting to be heroes after their brief altercation. The supposedly reformed bad guys have seen better days. In spite of this, they tell Guy that they wanted to feel what it's like to be like the JLA. Guy jokingly says that he'll speak to Max Lord about opening a branch of the Justice League in Antarctica. Ice doesn't find that funny. However, Green Lantern says that it will be. With that, Guy Gardner and his friends return to their headquarters to await another adventure. Story - 5: It's over the top, fun and scathingly witty. This is what made the Giffen/J.M. DeMatteis/Kevin Maguire run one of the best Justice League runs out there. They did the same thing with their great Defenders mini-series for Marvel some time back. If you don't find at least one thing humorous about this one-shot, there must be something wrong with your funny bone. 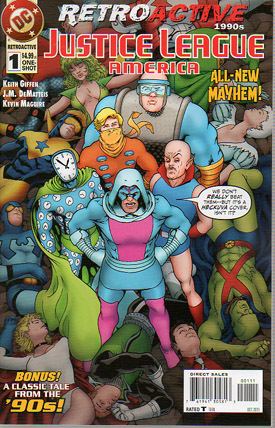 If you need a laugh, pick up DC Retroactive: Justice League of America - The 90s. You'll be glad you did. Art - 5: The art fits perfectly with the book and its atmosphere. No other visuals could have worked for this one-shot for me. Cover Art - 5: Like the rest of this book, the cover put a smile on my face. It also made me curious about the book's contents. In my opinion, the best images should do this for comic fans.